“Chocolate King” Petro Porosshenko won Ukraine’s presidential election, replacing Putin ally Viktor Yanukovych who was ousted in a violent coup in February. Large numbers of Ukrainian voters went to the polling center to elect candy magnate Petro Poroshenko as their new president on the first ballot. According to media reports, the former foreign minister won the election during the first round with between 55 per cent and 57 per cent. 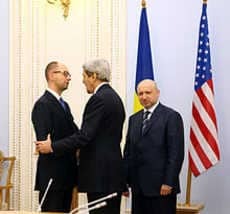 Ukraine’s interim Prime Minister Arseniy Yatsenyuk and Oleksandr Turchynov, the acting president of Ukraine, meet John Kerry, 4 March 2014. The 48-year-old candy tycoon Poroshenko is strong supporter of the movement that toppled pro-Russian President Viktor Yanukovych. The deadly coup in Febraury triggered Russia’s annexation of Crimea and violence by pro-Moscow separatists in the eastern part of the country. The election came three months after the country’s pro-Putin leader fled in February. Viktor Yanukovych was ousted from power over corruption charges and his decision to reject a pact with the European Union. In a press statement in Washington DC, US Secretary of State John Kerry congratulated the United States congratulates the people of Ukraine and the Ukrainian government for their historic elections on May 25th. He highlighted that the large turnout sends a clear message: the Ukrainian people want to live in a united, democratic and peaceful Ukraine anchored in European institutions. Secretary Kerry also underlined that the United States will continue to work with the people of Ukraine and the newly elected President to build on this victory for democracy. The US will support their efforts to determine their own future in a more united, secure, independent, and prosperous Ukraine. In December 2012, Kiev is engulfed by unrest when massive protest by pro-EU protesters stood their ground after an overnight sweep by riot police. The authorities sent in battalions of riot police with bulldozers to reclaim the Independence Square. There were records of scuffles and arrests. However, the riot police avoided entering the nearby City Hall and by morning they withdrew from the streets. In a press statement in Washington DC, US Secretary of State John Kerry condemned the destruction of a protest camp in central Kiev. The turmoil started in November 2013 when the President Yanukovich yielded pressure from Moscow and spurned a free trade deal with the EU.